Candy jewelry is another thing I've had a blast making! I started off by going through boxes and boxes of Valentine's day candy hearts to find the ones in best shape. The did something similar with gummy bears and then dipped them all in resin so they have a clear layer of plastic over them! I've turned some into charms, painting them with glow in the dark paint! I have many candy hearts ready to be made into something of your choice. Please note that since these charms are covered in a layer of plastic resin they are NOT edible. Although they are made from real candy, the plastic is not meant to be ingested. 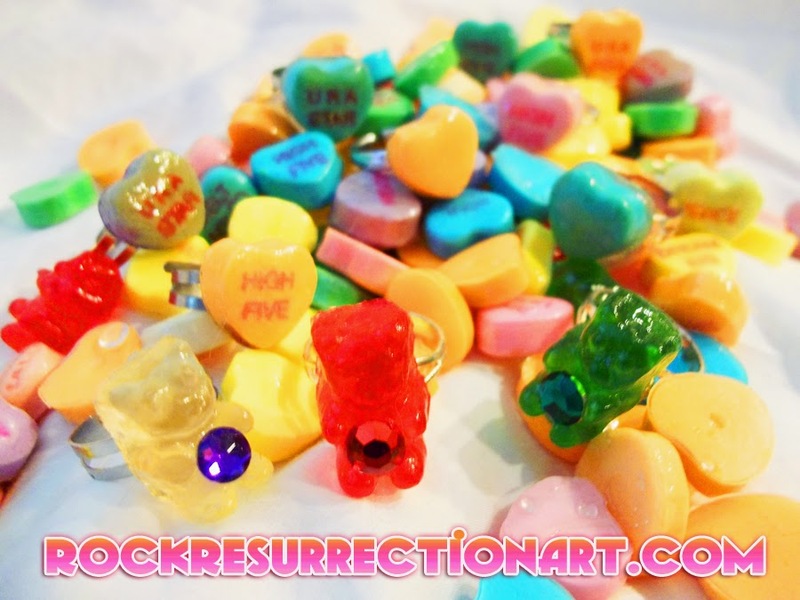 ✓ If you would like something custom made with these candy hearts or gummy bear charms click here.